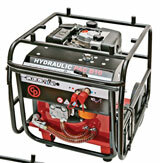 For the powering of hydraulic tools required for construction, demolition and maintenance projects in confined or remote spaces, Chicago Pneumatic’s new compact hydraulic power packs are built with foldable handles and large wheels. Regardless, the largest model in the PAC product family measures only 27.6 inches wide, 28.3 inches long and 29.3 inches tall. Available are both gas- and diesel-powered units, ranging 143 to 256 pounds in service weight. For connection to a variety of hand-held hydraulic tools including breakers and core drills, the power packs come standard with a 23-foot hydraulic twin hose fitted with flat-face, quick-release couplings.